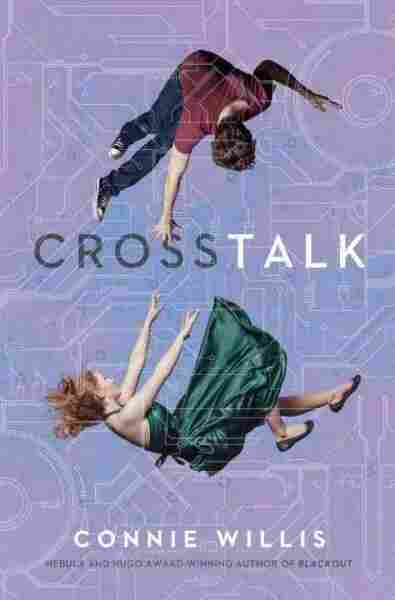 The Humor In 'Crosstalk' Gets Lost In The Hubbub Connie Willis' near-future tale of oversharing gone wrong follows a woman whose fiance wants to get an empathy-inducing brain operation for couples. The book aims for frothy farce, but falls flat. I love Connie Willis' writing. To Say Nothing of the Dog is one of my favorite books, a comfort read to which I often return; sharp, confident, deliciously funny, it seamlessly wove a comedy of manners into a science fictional premise that's delighted me for years. If I were asked to describe hallmarks of Willis' work, I'd name her pacing, character work, ear for dialogue and wonderful sense of humor. Crosstalk, unfortunately, is not a great showcase for any of those things. Briddey Flannigan is an executive at a communications company called Commspan, in stiff competition with Apple to produce the most revolutionary new smartphone, one that will make people more connected than ever before. Briddey herself feels a bit too connected to people — beset by nosy, overbearing co-workers and nosy, overbearing family members who text and call and show up unannounced at her work, it's all she can do to keep her almost-engagement to her boss, Trent Worth, secret. After six weeks of dating, Trent's proposed to her — but wants them to get special brain surgery together before they tie the knot. Called an EED, it's an outpatient procedure that's meant to make romantic partners feel each other's emotions. Briddey's keen to do it, in spite of the protests of her family and taciturn coworker, C.B. Schwartz — but things go wrong, shenanigans ensue, antics abound. My disappointment with this book is in large part a sort of helpless bafflement. It has so many elements I'd have expected to love. I'm absolutely here for meditations on our hyper-connected society, on how social media has shifted the meaning and performance of privacy, on how an increase in the quantity of connections sometimes means a diminishment of their quality. I'm also very happy to read romantic comedies — a genre built on foregrounding women's desires and agency — that focus on whole families. But Crosstalk isn't interested in nuanced exploration of any of these topics — which would be fine, if it ever actually committed to being outright farce. In a farce, conversations don't matter except as vehicles for miscommunication. Plots are mechanical; humor relies on unlikely and inappropriate substitutions; characters are caricatures. If Crosstalk were a farce, I might be able to excuse the exhaustingly irritating representations of Irishness, throwaway lines about Moroccan sheikhs and their wives, and pummelling overwhelm of incident. If I were seeing Crosstalk as a staged pantomime I might, possibly, forgive the fact that Briddey has no agency, that her personality and motivations consist entirely of making up excuses to avoid annoying conversations. But Crosstalk is trying to be something different, to have its farce-cake and eat it too, and the result is a half-baked mess. Instead of plot mechanics, we get Briddey being lectured at by everyone from her Aunt Oona — who is American but affects a fake Irish accent for reasons that are insufficiently excused by plot — to her colleague C.B., whose relentless unwanted attention is insufficiently excused by good intentions. There's no tidiness to these lectures — many of them are repetitive, speculative, meandering, especially in the latter acts, making the whole read like an early draft of a potentially better book. C.B. constantly brushes away Briddey's questions with "that's not how it works" — a phrase I found myself repeating frequently whenever Twitter, Facebook, smartphones or genetics came up. Willis treats present-day social media as a speculative technology, which makes for some embarrassing dissonance: Normal people seem to use Facebook as a tool for mass surveillance instead of broadcasting the minutiae of their own lives, Twitter hashtags include punctuation, and in one of the more painfully contrived plot developments, someone exclaims "You have to stop those tweets from getting out!" I don't mean to be Neil deGrasse Tyson complaining about orbital mechanics here; I'd forgive Crosstalk a great deal if it managed to be funny. But it's not. I wanted so much to be made to laugh, to participate in the sparkle and wit of a Connie Willis book, but couldn't. Instead I groaned and winced my way through in the hope that it would improve, but with the exception of a late-book turn that saw Briddey actually do something on her own initiative, it never did. Crosstalk feels, ultimately, like someone's half-hearted and unsuccessful attempt at writing a Connie Willis book. But if you do decide to read it and enjoy it, you can rejoice in knowing that literally everything else she's written is much, much better.